Posted on Fri, Feb 25, 2011 : 12:40 p.m.
Over at Zingerman's, it's time to make the donuts as Fat Tuesday leisurely approaches. I heard from Amy Emberling, managing partner at the Bakehouse, that this year for the first time, they're taking orders for paczki — those delicious Polish deep fried dough balls. They'll be filled with flavors including traditional plum and rose hip (mmm! ), and also raspberry, vanilla pastry cream and cream cheese. Crucifer, a name for the cross-shape of their four-petaled flowers, is an older label for the brassicas — which contain the mustard and cabbage family: radishes, turnips, broccoli, cabbage, bok choy, kohlrabi, cauliflower, rutabaga, arugula and kale. All those things that are so good for you are also among the vegetables that last the longest through the winter (Emily at Eat Close to Home just did a great post on root cellaring), and that show their sweetest nature during the coldest months. I heard Jeremy Moghtader of the MSU Student Organic Farm say that plants like Brussels sprouts and kale concentrate sugars in their cells during cold weather as a survival strategy. That's why they are best harvested after a frost. In the fall it has to compete with too many other things, but fresh winter kale, that lonely arctic warrior, makes me ridiculously happy in the coldest months. 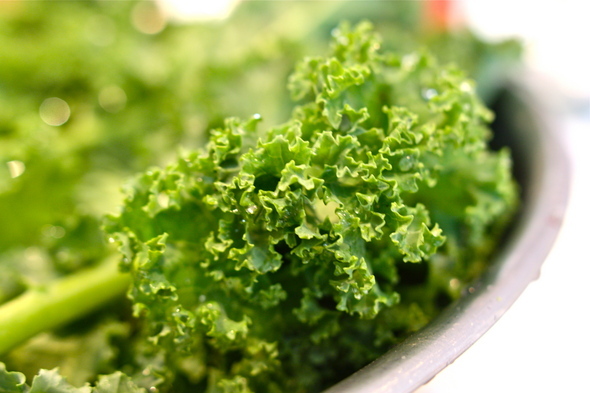 I do love kale, but I'm no match for my friend (dietician, author and now farmer) Diana Dyer, an incomparable devotee, with her blog called 365 Days of Kale. In addition to the greens we get in our winter CSA, I love the challenge of getting to the winter farmers' market hoping to be in time for even more hoop house-grown kale. Jonathan Goetz told me that, at Goetz Farm, they grow an especially curly variety in the winter — he thinks that all the additional surface area gives the leaves a better chance at soaking up whatever appears of the winter sun. In late fall I love making kale chips out of the large strong leaves. Just wash a big bunch, cut into palm-sized pieces, coat with a tablespoon or so of olive oil and a tiny bit of salt, then bake in a single layer until crispy, but not brown. This is a better snack than potato chips. And I looooooove potato chips. Eggs from Community Farm of Ann Arbor. But wintertime hoop house kale is smaller and much more tender than any other. I've been eating it for breakfast under a soft fried egg. Lightly sauteed with with a piece of toast on the side, I'm convinced there's nothing better to start the day, or the year. Now that the days are getting longer it's clear that spring is on its way. 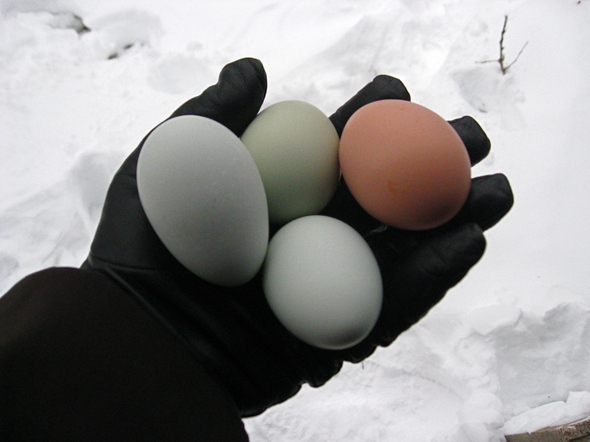 Mandy over at Dragonwood Farm says at their place for the past three years, spring has started with three signs: on the same day the maple sap starts flowing and their hens start laying, and soon after the indoor seeds start sprouting. For many of us, Paczki Day is spring's first milestone. Fat Tuesday is the gateway to spring, and even if you get a paczki, you can also choose the path of sweetness and virtue with a side of kale. a handful of kale here inside my pan. â€¨kale of a new face that my lips have never touched? â€¨and sun because it gave light to a new taste that brought tears to my eyes. I created — marvelous error — a bit of heaven inside my pan. Kim Bayer is a freelance writer and culinary researcher. Reach her at kimbayer@gmail.com. Tue, Mar 8, 2011 : 5:47 p.m.
paczki at Copernicus come from windsor. not that it matters. I trust those polish ladies to bring in the best paczki in town. I'm intrigued by the amadeus one, though. Sat, Feb 26, 2011 : 1:36 p.m. So what are paczki are Zingerman's? $100/dz? Of course, if you want free-range organic paczki, where else are you gonna go? Outsized, overhyped jelly doughnuts, people. Sat, Feb 26, 2011 : 2:20 a.m. Sat, Feb 26, 2011 : 3:16 a.m.
Ouch. Maybe step off the high horse and eat a donut. Fri, Feb 25, 2011 : 8:04 p.m. Sat, Feb 26, 2011 : 2:01 a.m.
Fri, Feb 25, 2011 : 8:28 p.m.
Fri, Feb 25, 2011 : 8:05 p.m.
Fri, Feb 25, 2011 : 7:51 p.m.
Dom's Bakery in Ypsilanti (24-hour bakery!!) has some of the best paczki's in town. They are located off of Washtenaw near EMU's campus. They never run out of them. Fri, Feb 25, 2011 : 7:32 p.m.
A kale-filled Paczki -- what a horrible thought. Sat, Feb 26, 2011 : 2:10 a.m.
Fri, Feb 25, 2011 : 7:28 p.m. There is a bakery down in Wyandotte that has some of the best around. Fri, Feb 25, 2011 : 7:11 p.m.
Ah, paczki!! I have to agree, it's the first sign of spring! I always get a couple for myself every year. Packed with calories, but it's a once a year treat. So, come on, and bring on Spring! I'm ready for it! Fri, Feb 25, 2011 : 6:38 p.m.
Arborwiki's Packzi page is more comprehensive than I remember it <a href="http://arborwiki.org/city/Paczki" rel='nofollow'>http://arborwiki.org/city/Paczki</a> and I wrote a story last year about where to go <a href="http://www.annarbor.com/vielmetti/links-paczki-day-2010/">http://www.annarbor.com/vielmetti/links-paczki-day-2010/</a> which I am certain will get another go-around this year with the details that have changed. Fri, Feb 25, 2011 : 6:35 p.m.
Yikes! Zingerman's Bakehouse says they are maxed out and can't take anymore preorders for paczki on Fat Tuesday. Does anyone reccommend other paczki in town or is Copernicus my best bet? Sat, Feb 26, 2011 : 4:47 a.m.
Dimo's Deli and Donuts, on W. Stadium, across from the post office. Their paczki, sandwiches...sheer gluttony! Amadeus might be of some help. Fri, Feb 25, 2011 : 6:01 p.m.
One food good for the body, the other good for the soul.